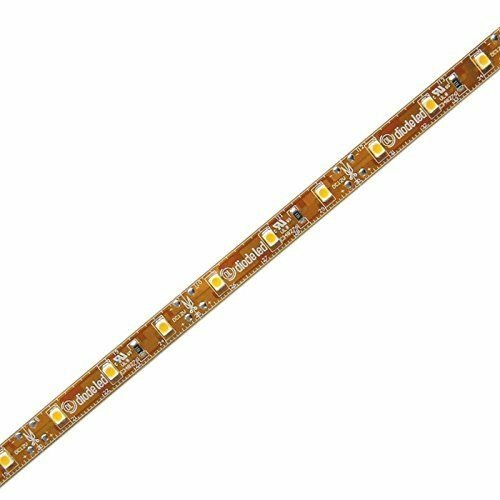 Diode LED DI-0010 FLUID VIEW 3528 SMD 100ft Warm White 2700k High Performance Luxury LED Light Strips The FLUID VIEW Strip Light is a light fixture that has it all. It's flexible, field-cuttable every two inches to a custom length, and dimmable. It's extremely low-profile, at a tenth of an inch high and third of an inch wide, it can be used virtually anywhere. It's a 12v fixture that draws 1.44 Watts per foot, making it very economical. To top it off, it comes in a rainbow of colors: cool white, amber, pink, red, blue and purple. Each spool comes with both a DC plug and lead wires attached that allow for easy connection to a power source, whether a 12v Plug-in Adapter or a Hard-Wired Driver, so it's plug-and-play. It comes with a 3M adhesive backing which allows for easy mounting on a clean, dry surface. The FLUID VIEW Strip is applicable in a lighting solutions liek interior coves and nooks, cabinets, hallways, display cases, shop windows, and exhibits. Fluid View Strip Light is great for any close application lighting. TheFLUID VIEW Strip can be powered by either a Plug-in Adapter or Hard-Wired Driver. TheFLUID VIEW Strip can be dimmed by our in-wall REIGN 12v/24v Dimmer Switches or by the Diode LED Hard-Wired Dimmable Drivers. Connectors come with one 3 foot bare wires on one end and a 12 inch white female DC plug on the other end. Voltage: 12V DC Color Temp: 2700k Color: Warm White IP Rating: Indoor Lifespan: 50000 hours Dimmable Width: 0.3 in. Height: 0.1 in. Lead Wire Length: 6 in. LEDs per foot: 18 LED Spacing: 0.65 in (between centers) Cuttable: Every 3 LEDs / 2 in / 5 cm LED Type: 3528 SMD LED Beam Angle: 120 degrees Power Consumption per ft: 1.44W UV/IR Radiation: None Lumens per foot: 115 CRI: 75 Length: 100 Ft. Each 16.4 ft (196.8 inches) FLUID VIEW Strip Light section needs to be separately wired to the power supply to avoid voltage drop.